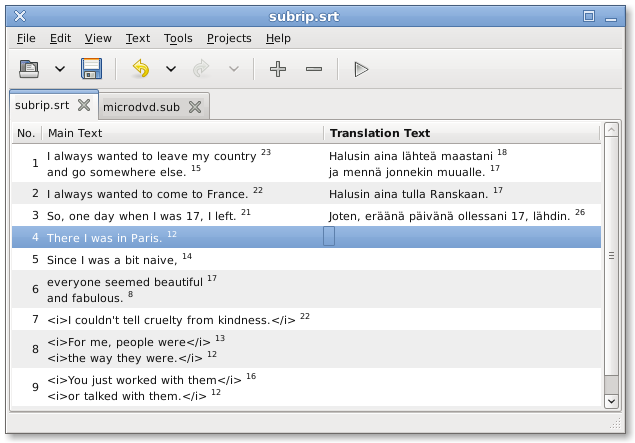 Gaupol is an open source software tool for translating subtitles within video. Gaupol works with open source systems such as Arch Linux, Debian, Fedora, FreeBSD, Frugalware Linux, Gentoo Linux, NetBSD, openSUSE and Ubuntu, but it will also work with Windows. Created to translate previously-created subtitles, Gaupol is not made primarily for initial subtitle creation or editing the original subtitles in the video. Like many programs used for subtitles, Gaupol gives you parallel columns to translate line by line. As a translation tool, Gaupol is simple to use for text-based subtitles with many small but useful features like the ability to find and replace text, framerate conversion and previews of the edits in an external video player. Gaupol is designed so that users can easily translate a group of subtitles at the same time and assign each to a specific time in the video. Gaupol is free software llicensed under the GPL.